Home / Articles in Roar / Is The Sinhala Language Haunted? The Sinhala language should be a goldmine for anyone looking at unearthing the jewels of the past. It is embedded with strata or layers from different times, showing how much the language has been overlaid by the influence of different peoples over the ages. In unearthing these layers, linguists become archaeologists, scouring lexicons instead of digging the earth. But why not go a step further and become a ghost hunter? Although we cannot say for certain that ghosts exist in real life, they certainly do in languages. Many a language has peculiarities that suggest another language may have influenced its vocabulary at some remote time, before vanishing without a trace. These are called ‘ghost languages’. Sinhala, so far as we can infer from an unknown substratum that pervades a considerable part of its lexicon, seems to be still haunted by such a ghost language. As the Mahavamsa tells us, the Sinhalese came from the Lala country (West Bengal state of India). True to form, Sinhala—like Bengali—could be shown to be an Aryan language. 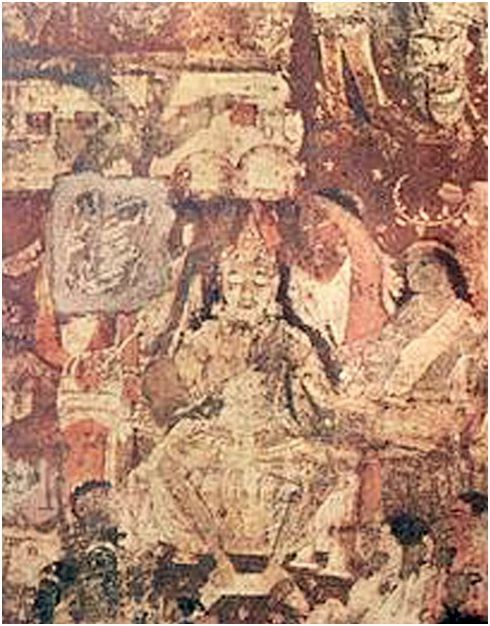 So Sinhala du or daughter derives from an older form, duhita (as found in Pali), which, in turn, is from a still older form, duhitr (as found in Sanskrit). This duhitr can easily be connected to the Persian dukhtar, Dutch dochter and English daughter. Its earliest parent form is *dhughater. Sinhala data or tooth derives from an older form danta (as found in Pali and Sanskrit), which is related to the Greek odont, Latin dent and Welsh dant. Its earliest parent form is *dente. Sinhala diga or long derives from the older form, digha (as found in Pali), which is from a still older form, dirgha (as found in Sanskrit). This, in turn, could be linked to the Greek dolikhos, Hittite dalugas, and Russian dolgi. All these go back to their parent form, *delugos. Yet, these basic terms form only a part of the vocabulary of Sinhala. Besides the original Sinhala derived from the speech of the earliest Sinhalese who hailed from Bengal, the language is overlaid with numerous Tamil loans that came by way of Dravidian invaders from South India, and Portuguese, Dutch, and English loan words that entered the language as a result of European colonialism. There is also a smattering of Arabic, Persian, and Malay loans that would have entered the language by means of trade. However, when we discount all these, we are still left with a considerable vocabulary of an unknown origin. Let’s call this language Language X. This language must have contributed to Sinhala—especially colloquial Sinhala—since very early times, since it has gained not only regional but also common nationwide usage. So it’s time we learned more about this Language X and its possible speakers. For want of a better term, we’ll call them X-Men. 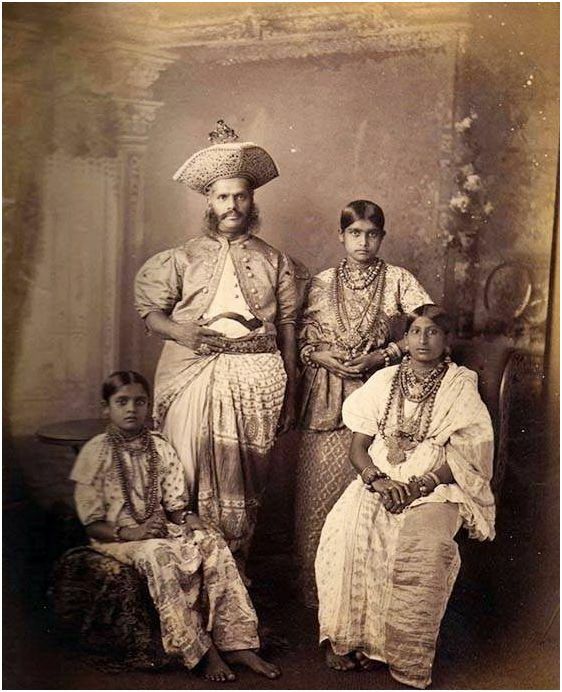 The Aryan prince Vijaya and his followers from Bengal become friends with the Yakkhini Kuveni. With her help, they massacre the Yakkhas of a city called Sirisavatthu, who are celebrating a wedding feast. Vijaya lives with Kuveni and they have a son and daughter. However, he refuses to be appointed king without a consort of Kshatriya origin like himself. A princess from the Pandya country is brought for the prince, who repudiates the Yakkhini. Taking the children with her, Kuveni departs to Lankapura, where she is killed by a violent Yakkha who takes her for a spy. The children flee to the Sumana mountain and, having grown up, live with one another and give rise to the Pulindas (Veddas). This story, though replete with betrayal and bloodshed, is very relevant to our discussion here. 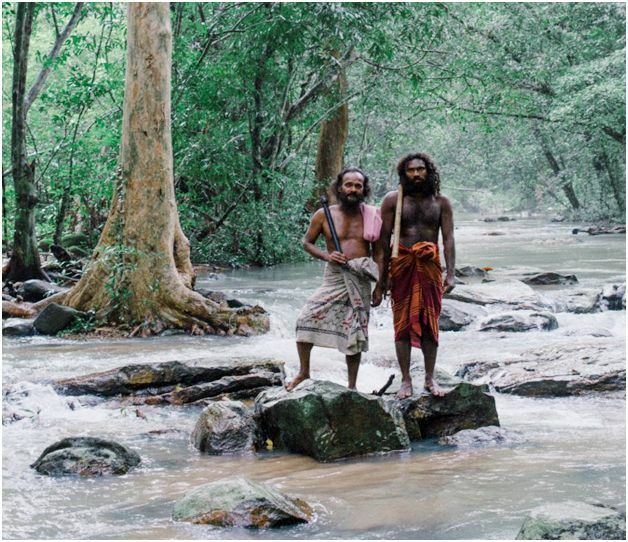 There were a tribal people living on the island before the Aryans came over and they were the ancestors of our aboriginal Veddas. Does this mean that the more materially advanced folk among the Yakkhas (who knew of wedding feasts, music, and spinning as the Mahavamsa records) were massacred wholesale and the less advanced, more tribal sections driven to the mountains and forests to eke out an existence far from the pale of Sinhalese society? Not so. There is evidence to show that the period of conflict between the Yakkha aboriginals and the Aryan-speaking invaders was short-lived. Not long after the Vijayan invasion we hear of the two peoples enjoying amicable relations, especially during the reign of King Panḍukabhaya and afterward. The Mahavamsa speaks of how a Yakkhini named Chetiya helped Panḍukabhaya acquire kingship by her wise counsel, suggesting that the king had been actually aided by a Vedda chieftainess in his campaign for sovereignty. Then there is the account of the Yakkha named Chittaraja who enjoyed such a high status as to be seated with Panḍukabhaya on equal seats at the time of festivals. This suggests that conciliation of the Yakkhas took place and was considered so important as to be demonstrated publicly. So it is perhaps the speech of the Yakkha ancestors of the Veddas that we have to look for to explain the origins of our reclusive ghost language that haunts Sinhala to this day. The speech of the Veddas today is basically a combination of modern Sinhala, old Sinhala, and an obscure non-Aryan, non-Dravidian element that may well constitute the remnants of the original speech of their ancestors. The Aryan Sinhala component is significant and one could suppose that it was imposed by the invaders on the native people over a long period of time. This is what is called in linguistic terms a ‘superstrate’ where certain words used by the ruling elite are adopted by the native folk. Sinhala, in turn, has what we call a ‘substrate’, linguistic features of the native peoples from whom it borrowed certain words and usages. Present day Veddas of Gal Oya. Image credit Roar/Christian Hutter. To this day, Vedda speech contains some distinct forms that seem to be remnants of an earlier language. Among these terms still used or recorded for us by the scholars of old are tuta for son, tuti for daughter, tomba for snail, kukka for dog, kokka for monkey, munda for monitor lizard, dola for pig, chappi for bird, kadira for bat, bagusa for pangolin, pombana for sky, gommana for evening, gabiachi for iron, moru for fungus and bokki for yam. Such Vedda forms as kukka ‘dog’ and chappi ‘bird’ are probably very old and may be connected to other languages spoken by similar dark-skinned aboriginal peoples of India and Southeast Asia. Kukka, for instance, resembles an old Munda term—chucchu—(for canine) once spoken in India, while chappi closely resembles the Sakai word chep spoken in the Malayan Peninsula. Although these have been preserved in Vedda speech, it is possible that the obscure non-Aryan element in Sinhala shared by both Sinhalese and Vedda today, arose from the ancestral tongues of the Veddas. For example, the Sinhalese to this day use words like balu-kukka meaning puppy and gomman-kalaya for dusk. Who knows, the colloquial Sinhala term for bowels—boku—may well be a Vedda loan, though now forgotten. Santali, a Munda language from Eastern India, has boko for ‘heart’ and it is possible that the original word meant the inside or interior organs of the body. 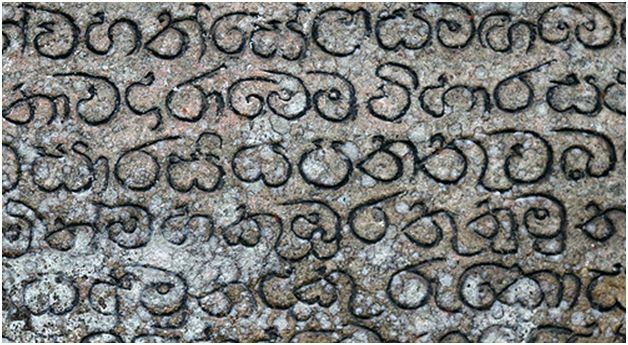 In fact, the obscure element in Sinhala is very pronounced and accounts for a good number of Sinhala words, including such common terms like kola or leaf, gemba or frog, hakka or jaw, bella or neck, bokatu or curly, bilinda or child, bolanda or immature and golla or ‘forest, clump, cluster’ as occurring in place-names such as Imbul-golla and Damba-golla. What we can see from all this is that Sinhala, like many other languages, is not a pure language, but is rather mixed. And this mixture has taken place from the earliest times, with their telltale signs evident in the language itself. Mixing is not a bad thing really. It gives vibrancy to a language and. as they say, variety is the spice of life!